Christmas was good to me, I hope it was good to you. We ate, drank, and were merry for four days straight. I think I mentioned before we had ten people at our house for the holidays. All of my family and Nik's. It was a ton of fun and they have all decided that they will be back next year. We did agree they could come back. As always, as soon as the long break was over I was itching to get back at making beads. I don't sit still well. I am in the process of moving my studio home. I have been at great pottery studio for the last year. It was supposed to be a transition studio when we moved to Georgia the summer before last. I enjoyed being there so much, I just stayed. But over the last few months it has been getting harder and harder to work away from home. 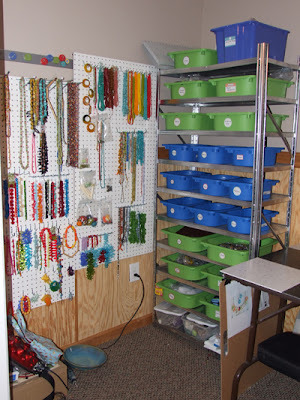 My computer and all of my beads are at my home studio. So I really have two studios. It just seems logical and more efficient to have everything in one place. 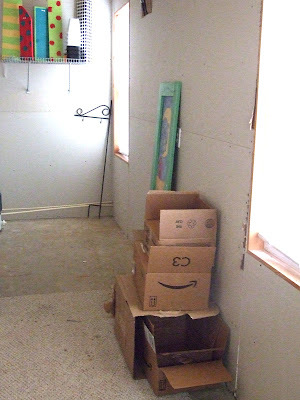 I took a picture of the empty storage room that will be my making and glazing room in a few weeks, if all goes as planned. This room was full of garden tools and storage this morning. My parent's were still here for the holiday so I put my dad to work. (He doesn't sit still either) We spent the morning cleaning it out. Hooray! It is done. 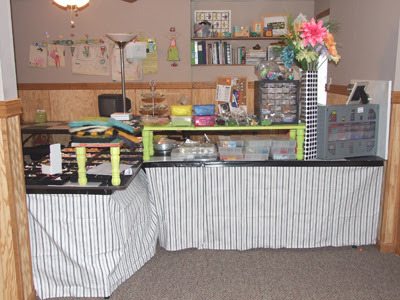 Now the hard part of getting everything from my away studio here, ugh, that's next weeks job. 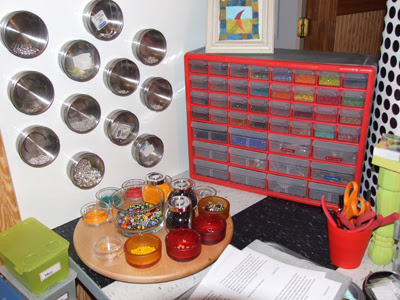 I am also including a picture of my bead studio. I bought this great book called "Organizing your Craft Space", it inspired me to make it pretty as well as functional. I had a ball finding storage and labeling everything. I am so happy now that I can find everything. It took about a week to get everything organized and in it's place.